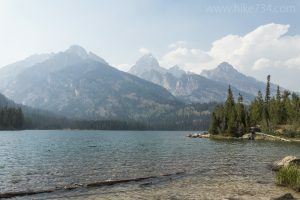 This short, family-friendly, out-and-back hike takes you to a fabulous lake tucked beneath the mighty Tetons. A glacier descending from Avalanche Canyon created Taggart Lake. Even from the trailhead parking lot, the unimpeded views of the Tetons are stunning. Stay right at the first junction located a short distance from the trailhead. You briefly lose sight of the Tetons as the trail crosses over Taggart Creek. The trail then climbs up onto the moraine through the trees, alongside the playful creek. The impressive mountains quickly come back into view as the trail levels out. Continue left at the junction where the trail quickly enters the trees, then pops out on the shores of this quaint, but impressive lake. There are plenty of places to sit and enjoy the stunning mountains and serene lake. Explore the shoreline in both directions, particularly south to the lake’s outlet, before heading back. 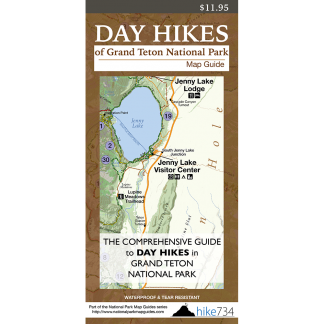 Trailhead: The parking lot for the Taggart Lake Trailhead is on the west side of Teton Park Road, halfway between Jenny Lake and Moose.